Is the Bounce appropriate for exercise such as jogging or running? Can I fold the Redsbaby Bounce with the seat or bassinet attached? What fabrics are used on the Redsbaby Bounce? Is the Redsbaby Bounce seat suitable from birth? Do you have any videos that I can watch that show the Bounce in action? No. The Redsbaby Bounce seat is not recommended for use until your child reaches the weight limit of 9kg (20 lbs), are 6 months of age, or when your child can sit up unaided (whichever occurs first). If you feel that your child needs to transition to the seat before either of these three milestones have occurred, you can do so using the seat in the flat position. 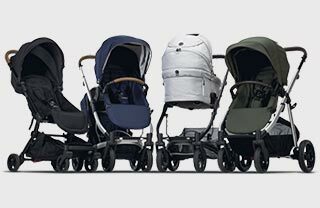 Please note, the BOUNCE Pram has been retired from the Redsbaby Family and is no longer available to purchase. Is the Move suitable from birth/ for newborns?